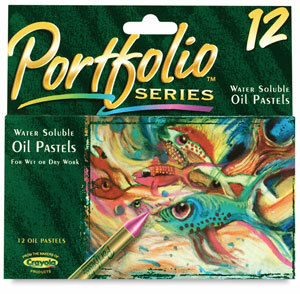 These are versatile, water-soluble oil pastels that offer students flexible features. The traditional creamy pastels come in bright, vivid colors. Use simple techniques like dry blending into true secondary colors, and wet blending into watercolor techniques. Each pastel measures 3¼" long × ½" diameter (83 mm × 13 mm). Classpack of 300 — The Classpack has 300 sticks in 12 brilliant colors. It's an economical way to use Portfolio Series for the whole classroom. Package of 12 — Includes one each of 12 colors. Package of 24 — Includes one each of 24 colors. Classpack of 300 — Includes 25 each of 12 colors.